Takeshi Inomata, a professor of anthropology at the University of Arizona, writes from Guatemala, where he and Daniela Triadan are excavating the Maya site of Ceibal, Guatemala. Takeshi Inomata - Maya archaeology has changed greatly since this structure at Ceibal was excavated and restored by a Harvard team in the 1960s. There are various types of archaeology: small test pits, wide-area exposures, architectural reconstruction, regional survey, etc. Our strategy at the Maya site of Ceibal (also written as Seibal in English literature), in the tropical lowlands of western Guatemala, is decidedly a vertical pursuit. Dig deep and trace 2,000 years to Ceibal’s occupation history back to its beginning. This is our fifth season, and this year we have been working in the jungle since early January. Some of our excavations are now reaching a depth of seven meters, sequentially exposing, in some cases, more than 30 construction episodes. We came to this site after completing 17 years of work at another Maya site in the same region, Aguateca. Our options were to start a new project in a different part of the Maya area or to stay in the same region. We chose the latter over the beaches in Quintana Roo and the cool, mosquito-free weather of the highlands mainly because we wanted to continue to foster relations with the local people whom we have been working with — in particular, underprivileged Q’eqchi’ Maya farmers. In this case, Ceibal was an obvious choice. 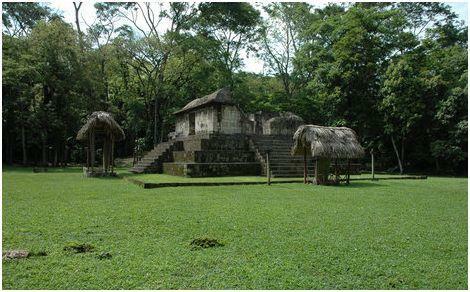 It holds a special place in the history of Maya archaeology. In the 1960s, the site was explored by a team of archaeologists from Harvard University. Their survey and excavation revealed one of the longest occupation sequences in the southern lowlands, laying the groundwork for our understanding of pre-Hispanic Maya culture and society. Since then, Maya archaeology has transformed itself. Excavation methods have become more sophisticated, and archaeologists can choose specific procedures from a wide array of tools, tailored to their research objectives. The application of scientific techniques like chemical, isotopic and microscopic analyses of artifacts, bones and soils gives us information about their origins, functions, dates and use by humans. And Maya writing has been largely deciphered. We now know the names of kings and their deeds, and we can correlate turning points in Maya history with archaeological data from the ground. In light of these developments, Daniela Triadan and I, along with our colleagues, decided to revisit this key site in 2006. Dani’s and my home institution, the University of Arizona, has been supporting us in various forms, including our current research leave. Subsequent funding came from the National Geographic Society, the National Science Foundation, the National Endowment for the Humanities and the Japanese Ministry of Education, Culture, Sports, Science and Technology. We are deeply grateful to the Guatemalan Institute of Anthropology and History for the permit for our work at this important site. 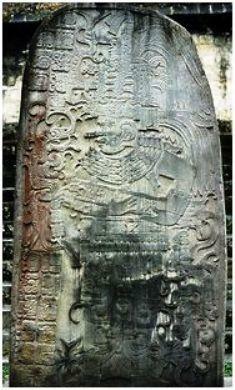 Takeshi Inomata - Ceibal Stela 10, dating to A.D. 849. The heyday of Ceibal, as with many other lowland Maya centers found in southern Mexico, Guatemala, Belize and Honduras, was the Classic period, corresponding to A.D. 150 to 950. It was the time when rulers erected magnificent stelae, proudly narrating their achievements in hieroglyphic inscriptions, and constructed large pyramidal temples as their eternal resting places. For us, really interesting stories lie in the era preceding the Classic splendor, the Preclassic period that dates to around 1,000 B.C., in the case of Ceibal. 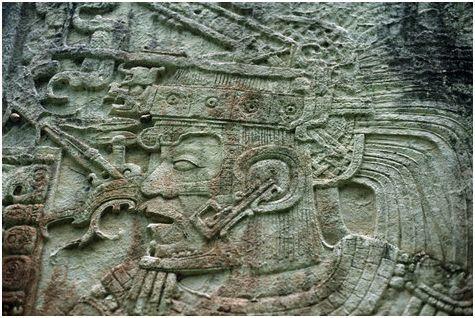 How did Maya rulership and centralized governmental institutions emerge? How did early Maya people adapt to the tropical lowland environment to support large populations? We wanted to explore the origins of lowland Maya civilization. Ceibal is well suited for the study of this question. The Maya people periodically expanded their pyramids, platforms and houses by covering old buildings with new ones. Like peeling an onion, archaeologists reveal older constructions layer by layer. At Ceibal those successions of constructions are particularly impressive. It appears that wherever we stick trowels, we find deep accumulations of early constructions buried under Classic-period veneer. Ceibal must have been one of the premier centers in the Maya lowlands in the Preclassic times. This pattern was already clear during the Harvard project, though the Harvard researchers focused mainly on the Classic period, partly because deeply buried early remains were hard to get to. To reach the earliest buildings, we have to choose the right sites for a small number of excavation units, concentrating our efforts and resources. Takeshi Inomata - Ceibal ruler depicted on Stela 11. We want to find the earliest of Ceibal’s Preclassic buildings because our biggest question is about its beginning. Excavations in open plaza areas, where we can go through entire construction sequences within depths of four meters or so, tell us that archaeologically visible settlements at Ceibal began around 1,000 B.C. Before that date, the area appears to have been sparsely occupied by mobile groups who practiced small-scale horticulture along with hunting and gathering. Their population was so small and their buildings so ephemeral that the traces of their lives, other than evidence of forest disturbance found in lake sediments, have evaded detection by archaeologists. Many people tend to assume that the transition from such seminomadic small groups to fully sedentary communities was gradual. But settlements at Ceibal may have begun with a big bang. The Harvard group in the 1960s and our team in 2009 found ritual deposits of polished axes made of jade and other types of greenstone that were placed before the first floor of a communal plaza was laid. Ceibal’s residents seem to have devoted themselves to elaborate ritual as soon as they settled in this place. Moreover, we have tantalizing signs that from the very beginning Ceibal may have been founded as a formal, well-planned ritual center with substantial buildings. But this is just a hypothesis. To prove or disprove it, we have to reach the cores of Ceibal’s main buildings. 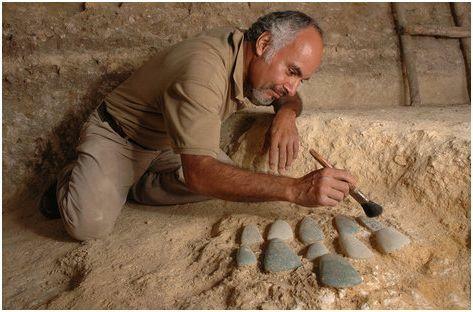 Takeshi Inomata - Otto Román, a Guatemalan archaeologist, excavating the cache of polished axes that we found in 2009. This ritual deposit marked the beginning of occupation at Ceibal around 1,000 B.C. The challenge is daunting. Excavations of more than seven meters in depth with numerous layers are extremely time-consuming. We need to clean and document each layer and examine the presence of any deposits of ritual objects and other materials. Discoveries of caches of greenstone axes or ceramic vessels, which are not uncommon at Ceibal, are exciting, but they mean substantial time and work. And we have to deal with the physical danger of excavating deep pits and the technical difficulties they present. Our first pit at this site penetrated 36 layers to a depth of 7.5 meters, but the excavation area at the bottom became too small and precarious, and we had to close it. Another pit that we have worked the last two seasons also reached 7.4 meters in depth, and at the end of the last season we sealed it with a laminated metal roof. When we returned to the site this season, we were dismayed to find that its walls had become unstable. Early in this season we excavated yet another pit down to a depth of seven meters, where a loose stone fill prevented us from continuing. These setbacks have not deterred us from pursuing our goal of reaching the bottom of Ceibal’s construction layers. We are determined to find out what story this site has to tell us about the origins of lowland Maya civilization, while keeping our crew safe.